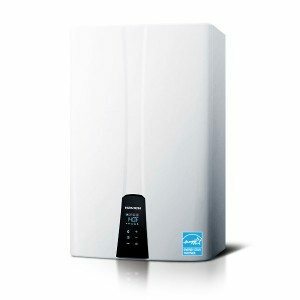 Tankless Water Heaters, How It Works! Last month the Fox Plumbing & Heating Blog covered the growing trend toward installing tankless water heaters in Seattle. There are so many benefits to “on-demand” water heating including energy savings and endless hot water. But how exactly do tankless water heaters work? Fox’s neighborhood professional plumbers share more about this great water heater technology in part two of our series. Fox’s customers often ask what we mean by on-demand water heating. 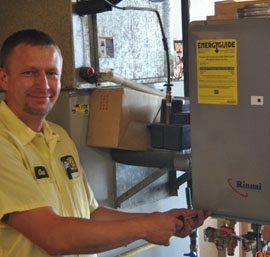 After all, “when I turn on the faucet with my tank water heater, I get hot water, isn’t that the same thing?” While the outcome is hot water in both cases, “on-demand” in a tankless water heater refers to the method by which the water is heated. In a typical 50 gallon electric tank water heater, the electricity is feeding a set of two heating elements in the tank. They keep those 50 gallons of water nice and hot for you 24 hours per day. In a natural gas tank water heater, there is a burner which provides the same service. When you take a shower, you may use most or all of that water. As you draw down the hot water in the tank, new cold water is added. If you are using a lot of water, the tank won’t have had enough recovery time to bring that cold water up to temperature. Most of us have experienced the agony of a shower going cold, or having to wait after one person showers before hot water is available for the next person. On-demand water heating eliminates these issues. A tankless water heater heats water when it’s needed. When you turn on the faucet, the tankless detects how much water flow you are calling for. Only then is the igniter activated, fuel (gas or propane) comes in and the burner starts making your water hot. This saves fuel because it’s used only when it’s actually needed, and this makes a tankless water heater energy efficient. The water then streams through a heat exchanger (or two depending on make and model), which transfers heat from the burner into the water. Once the tankless is streaming hot water, it continues to be hot until you turn off the tap. In some tankless models, this sequence can create a 5-10 second delay in the start of hot water. Advanced tankless units, such as the Navien NPE recommended by Fox’s plumbers, have features such as a built in recirculating system and buffer tank that works to minimize that delivery time and eliminate cold water sandwiches. The time it takes for hot water to reach any of your fixtures will remain the same with a tankless water heater. That’s an entirely different issue, one that can be corrected by one of our plumbing professionals at Fox Plumbing & Heating. The delivery of hot water on demand is only one of the great reasons that tankless water heaters have become popular in Seattle homes. For more information, contact our expert plumbers.